Old wine and old books are always on perennial demand. My fortune of reading great books lies with my source material I bank upon - Quotes. The sayings or quotes of great authors, celebrities, successful businessmen, sports-persons and above all wisdom masters attract my eye. Through these quotes, I was introduced to some of the greatest writers like Khushwant Singh, Ruskin Bond and the list is endless. If you dig deep into the books of any great wirter, you find their favourite authors who influenced their lives. I do this digging process on weekends and it gives me the highest joy. Great writers of past centuries like Ralph Waldo Emerson, Henry David Thoreau, Orison Swett Marden, Benjamin Franklin etc. came into my radar only after I ploughed through Internet since 2011. The beauty is, books of all such great authors are freely available on internet, and the only prerequisite is, you should have a heart to search for them. The other day, I was re-reading Ruskin Bond's small volume called A Book of Simple Living - Brief Notes from the Hills. It is a sort journal written by Ruskin over the years. 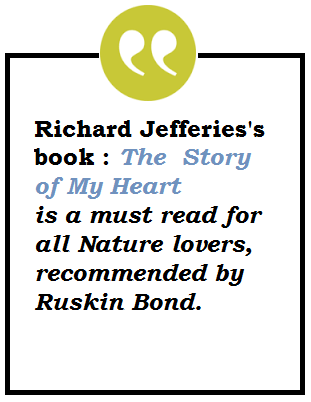 While giving a brief account of his return journey to India from U.K., in 1955, the then twenty-one year old Ruskin says that I had two books with me - Thoreau's Walden and Richard Jefferies's The Story of My Heart. I already read Walden which is a mine of wisdom on simple living. But, little I know about the other writer Richard Jefferies, Ruskin referred. When I curiously looked into Google, I was taken to the direct link of Jfferies's book The Story of My Heart. 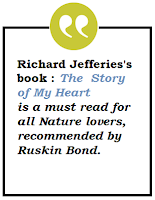 This book is a must read for all Nature lovers, recommended by Ruskin Bond. Once you read this book, you never feel lonely, even if you are alone and that wisdom takes your life to next orbit.